Dunrobin Castle is also one of Britain’s oldest continuously inhabited houses dating back to the early 1300s, home to the Earls and later, the Dukes of Sutherland. The Castle, which resembles a French chateâu with its towering conical spires, has seen the architectural influences of Sir Charles Barry, who designed London’s Houses of Parliament, and Scotland’s own Sir Robert Lorimer. The Castle was used as a naval hospital during the First World War and as a boys’ boarding school from 1965 to 1972. Dunrobin Castle is on the east coast of the Northern Highlands overlooking the Moray Firth, just north of the villages of Golspie and Dornoch (famous for its cathedral and Royal Dornoch Golf Club). 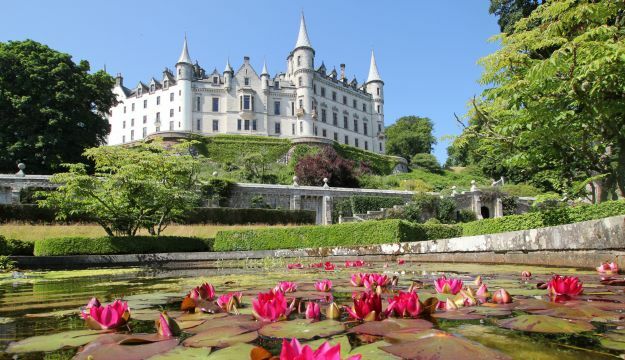 A visit to Dunrobin Castle now includes falconry flying demonstrations at 11.30am, and 2.00pm on the Castle lawn. See spectacular shows featuring golden eagles and peregrine falcons, both resident birds in the Scottish Highlands. Learn more about other local birds of prey as well as the ancient art of falconry. Additional attractions include more exotic species such as the European Eagle owl. Andy Hughes, our professional resident Falconer demonstrates and explains the different hunting methods used by owls, hawks and falcons in a series of fascinating aerobatic displays. Every show creates superb photographic opportunities. Birds of prey and Falconer are available until 3 pm every day photographs.